In July this year, India saw the advent of a new tax regime aimed at unifying the sprawling markets as disparate and diverse as the people of the country itself. Citizens responded with mixed emotions of welcome and disapproval. While Goods and Services Tax (GST) is not new to the global markets, it took the Indian market by surprise. It is also ironic that GST which in concept is simpler to surmount is more confusing to the Indian market and society than the former multi-layered indirect tax regime. GST subsumes as many as 17 indirect taxes (Central and State) and around 22 types of Cess into one single tax. This is a revolutionary move in the history of Indian taxation. First for a more comprehensive understanding, GST is a tax on value added. It is a tax on the final consumption and on the final consumer based on a harmonization principle of unified tax and single market across the country. It will function by being taxed at every stage of the production-distribution chain. It will be refunded at the stages of input purchase, production, wholesale and retail through the mechanism of Input Tax Credit (ITC). The objective is to prevent cascading of taxes, avoid built-in taxes (eg excise duty at the factory gate, duty on equipment used by telecom companies etc. ), increase selling prices and increase tax revenue by more voluntary compliance. If it proves effective, there is an anticipated increase in GDP by 2%. But implementation of GST has not gone down well with commoners in India simply because the initial impact on the market has been an increase in the price of goods and services. This is also because taxes have become more visible post GST as compared to earlier when they were hidden and built into the price itself. What was visible earlier was a VAT imposed by states at the retail level or the service tax imposed by the Centre. Not only the new 5%, 12%, 18% and 28% based on the divided categories of essentials, necessities and luxuries have left the public confused, it has not resulted in an immediate fall in the prices of goods and services. What’s worse, there has been an increase in prices payable by consumers which has left them perturbed. The general public, people on the margins and the disabled people are all at the receiving end of this new tax regime. While the middle and the lower classes are facing a monetary disability, the disabled are facing a double blow. Disability imposed by the able-bodied vision of the world and the economic demands for changing that vision. With 5% GST being imposed on disability equipment, clearly the message being sent out is not one of inclusion. Unfortunately, this notion of economic demands and costs associated with disability is rooted in misconceived perception that the disabled cannot contribute economically and socially. And to nurture such ideas is in conflict with the UN Convention on the Rights of Persons with Disabilities (UNCRPD), Right to Persons with Disabilities (RPWD) Act 2016 and all other steps taken to spread awareness and bring about change. To impose GST on wheelchairs and Braille papers is literally taxing the disabled person for trying to overcome his/her disability, that is walking and reading! This is not justifiable and it in fact nullifies all the provisions, rules and guidelines envisioned within the RPWD Act 2016 which was cleared by the government six months ago. Government of India is contradicting itself to be passing a progressive legislation in December 2016 and following it up six months later with something that will hinder the former. This is typical of all legislations passed in India, when pitted against each other, they implode. Disability activists have been vociferously protesting against the GST roll-out. Following a PIL filed by wheelchair bound Nipun Malhotra, the Supreme Court has issued a notice to the Centre seeking a response on the matter. Government in its statement responding to the public outcry had said this is to create a win-win situation for the domestic producer and the disabled population. This might be true in concept but is totally void in logic. The domestic producer pays 18% tax on the raw materials for making disability equipment, which is refundable through the ITC mechanism. The ‘concessional rate’ of 5% would bring in some tax revenue to credit the taxes incurred in the production-distribution chain. If these goods are made tax free to the final consumer, the input taxes led cost would ultimately perish the industry in India especially when facing competition from imported disability equipment which is duty free. And on the other hand, we have optional goods like bindi, kumkum, bangles, sindoor etc. exempted from GST and polished diamonds, gold being taxed at just 3%. That makes no logical sense. The fact that disability and poverty form a vicious circle and any increase in price would make life harder for the disabled population is simply ignored. This either reflects the regressive attitude of a government rooted in neoliberalism towards the marginalized or its obsession with showmanship for these illogical effects. Declaration of demonetization was also similar in nature, it neglected the commoners and the gigantic unorganized sector in India. It has resulted in nothing positive for economic reforms except substantial losses. GST in its current form is only taking money out of the pockets of the poor and fattening those of the rich. Since we are a country where 70% of the population resides in villages, out of which 30% is Below Poverty Line (BPL), the rationale must be to feed this section rather than the micro rich. This makes the Opportunity Cost (Return on the most lucrative option­­ – Return on the chosen option) for the disabled life hindering. 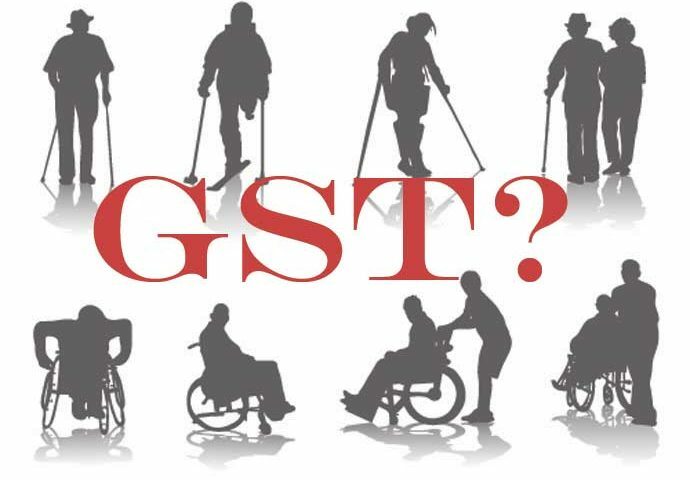 Where its stands, GST on disability does the same- Extorting the marginalized!